“Cauliflower 65,” fried cauliflower with chutneys. You notice the blazing intensity of chef Raj Mandekar’s shrimp balchow as soon as it arrives at your table. The deep-red sauce practically glows, and its pungent, earthy aroma mingles with that of freshly puffed and blistered naan. The plump, tender shrimp were lightly sautéed before being simmered in a tomato-based gravy spiced with the deep, complex flavors of dried chilies, curry leaves, mustard seed, and garlic. The balchow’s burn creeps up slowly, building in intensity, but all your body’s fire alarms can’t keep you from mopping up every last bit of sauce and shellfish. 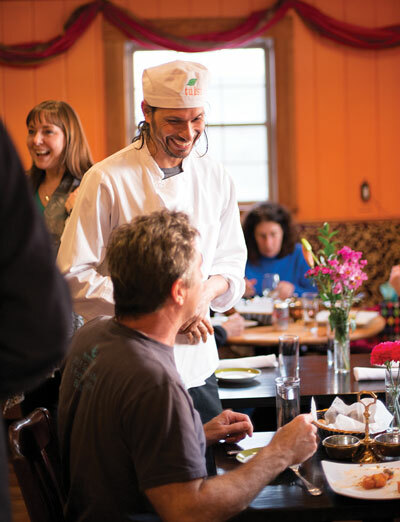 It’s no surprise this dish, a staple of Tulsi, Mandekar’s first restaurant in Kittery, found its way to his seafood-centric menu at Tulsi North. A specialty of India’s Goa region, it exemplifies his cooking style. 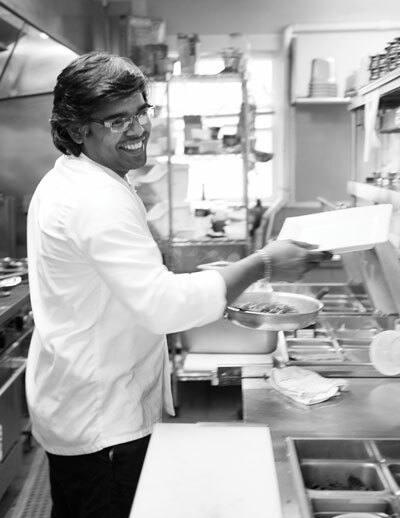 Mandekar is among a new generation of Indian cooks who hew to the cuisine’s classical foundations while experimenting with innovative flavors. 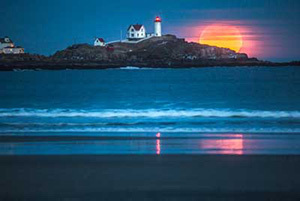 Tulsi North, which Mandekar co-owns with Janet Howe, is a welcome alternative to the fried-seafood shacks that dominate this stretch of Maine’s southern coast. 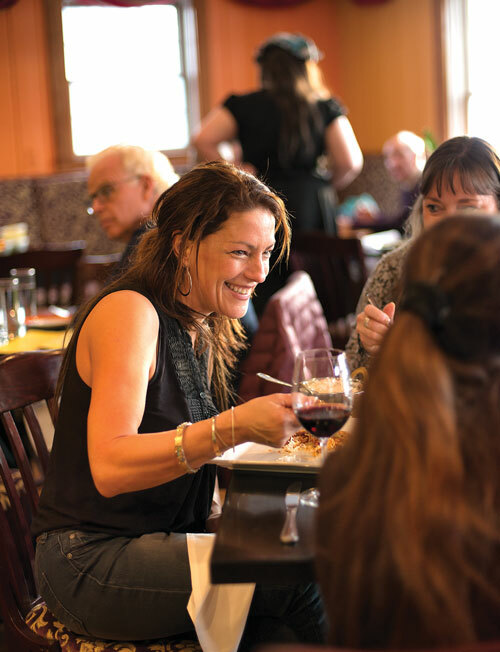 Housed in an eye-catching, deep-purple, red-trimmed, ranch-style building on Wells’ main drag, it’s decorated inside with warm, muted tones that create a soothing ambiance and emphasize the bright, pronounced colors of the food. A large patio accommodates Wells’ summer crowds. 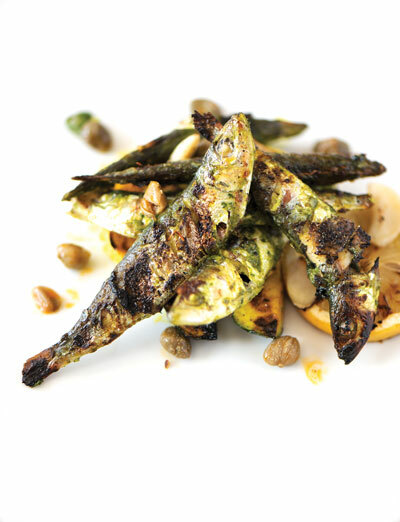 Grilled sardina in white wine and cilantro; Chef/owner Raj Mandekar has built on the success of Tulsi, a Kittery institution, with Tulsi North, focused on seafood and Goan dishes. 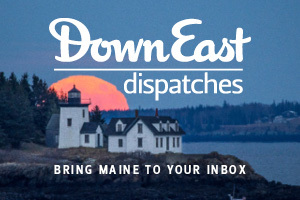 Such humble comforts have inspired Mandekar to emphasize coastal south Indian cuisine at Tulsi North, instead of the more familiar Mughlai and Punjab cookery he offers in Kittery. “I want to prepare seafood that people are familiar with, using spices and textures that most diners aren’t yet accustomed to,” he says. He takes the same approach to the menu’s vegetarian options. Consider the Indian staple karela, or bitter melon, which Mandekar concedes is an “acquired taste.” He tempers the astringent flavor with potatoes, chilies, and peas, which allows one to appreciate the vegetable’s nuances without being overpowered by it. 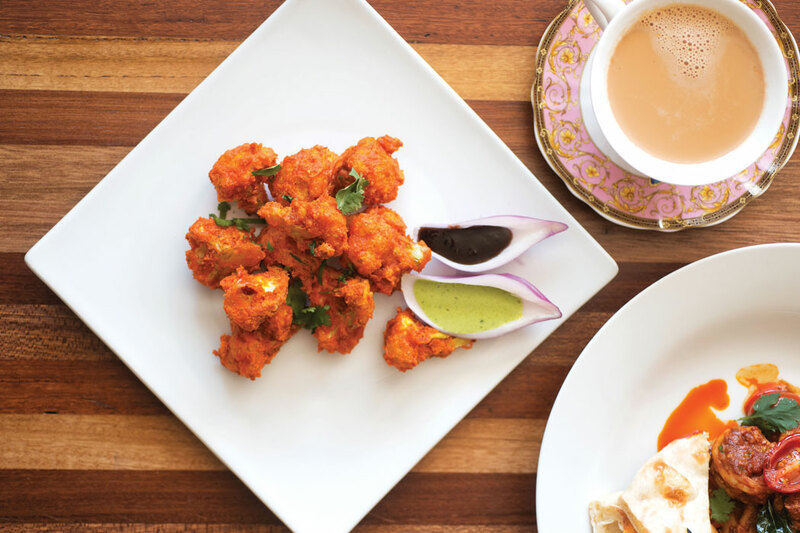 Another veggie dish, Cauliflower 65, is golden, deep-fried cauliflower morsels accompanied by mint and tamarind chutneys. Chili Idli, lentil fritters glazed with a slightly sweet and sour sauce, is reminiscent of takeout Chinese. 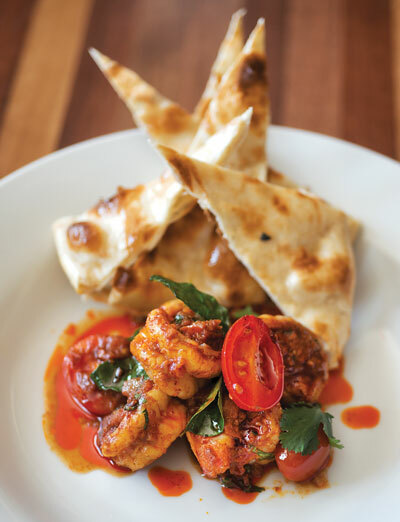 For his seafood preparations, Mandekar typically relies on the flavors imparted by the grill and modest ingredients like garlic, cilantro, and green chilies. Whole smelts are charred and served with meaty, pan-fried trumpet mushrooms. Grilled calamari are accompanied by sausages, another nod to the Goa region, a former Portuguese colony. 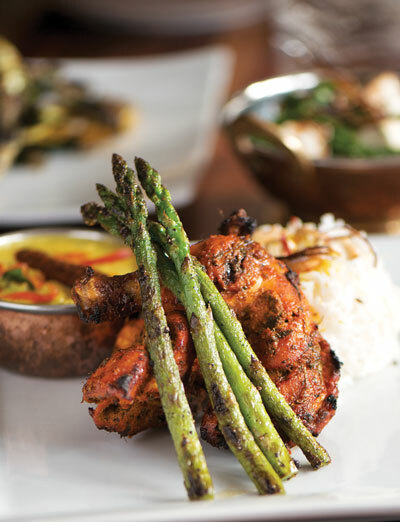 Tandoori chicken with asparagus and yellow dal; From the bar, a mango martini; Zaffrani jhinga, shrimp sautéed in garlic, wine reduction, cashews, and a creamy saffron sauce; Sous chef Bala Muthu in the kitchen. 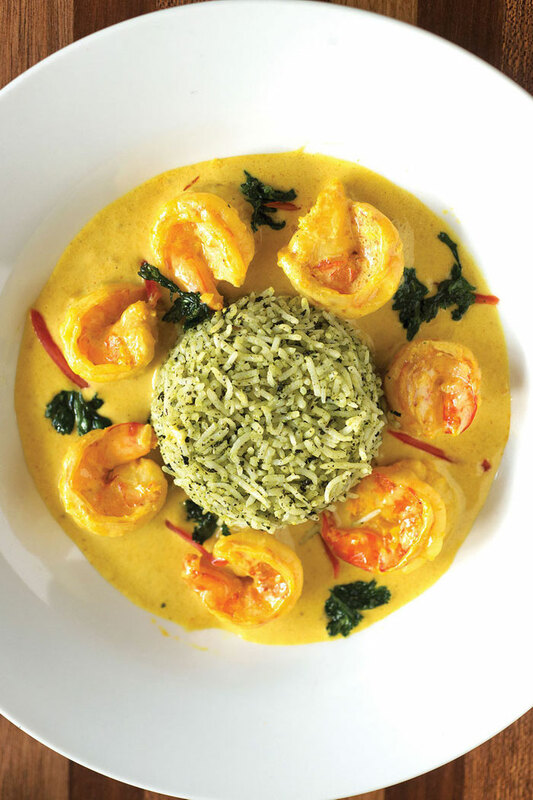 Among the more luxurious dishes is zaffrani jhinga, an unbelievably silky preparation of shrimp in cashew and saffron cream sauce, ladled over fluffy basmati rice and served with mint chutney. If you can sample just one dish at Tusli North, make it this one. Looking ahead, Mandekar expects to offer Indian-influenced versions of haute cuisine classics like lobster thermidor and seasonal dishes like seared scallops with sweet corn and mango cream sauce.  The menu also includes an array of meat dishes, including a mind-blowing chicken tikka masala and a lamb sukka — cubes of lamb braised with garam masala and finished with tomato and cashew cream sauce. 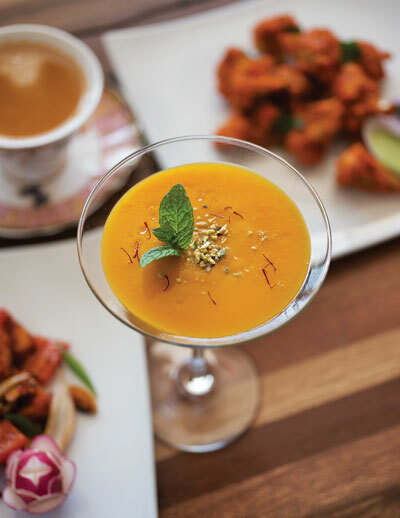 Tulsi North has a full bar with a succinct assortment of wine and beer (think dry rosé and very cold Taj Mahal lager) chosen to refresh and complement the myriad Indian spices and herbs that would otherwise bulldoze most delicate libations. Desserts include Muthu’s rasmalai, a Bengali dish consisting of soft, fresh cheese that has been saturated with condensed milk, pistachios, and almonds. Mandekar’s food is beautiful and delicate, yet unapologetic in its boldness and, in many dishes, its heat. Located next door to a building that looks like a block of cheese with a mouse on top, Tulsi North is an unexpected and exciting addition to Wells’ restaurant scene.